So, many of you have checked in with me to wish me luck with the move, and I wanted to let y’all know that we survived and have arrived at our new destination. The move itself went as smoothly as possible, considering that once the movers arrived I realized that I could easily have my own tv show that is a combo spinoff of Hoarders, American Pickers and Samford and Son. If you follow me on Instagram you already know this, but they sent three huge moving trucks to our house last Wednesday and by mid-day the head mover was calling for a fourth truck for backup (which wasn’t available). 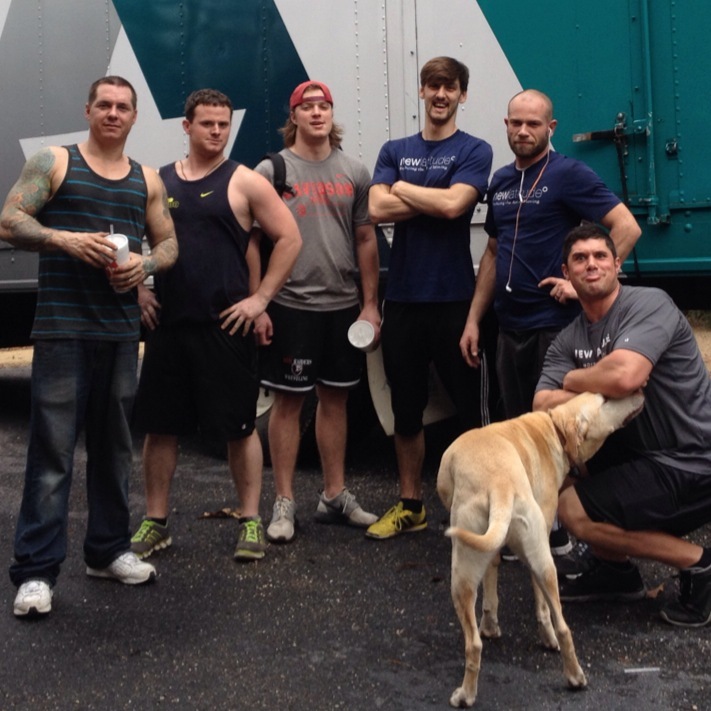 This group of superhero movers worked so hard to get all of our stuff moved but by 9 pm they were exhausted and had to call it a night. The next load of stuff (including all of our shoes and clothes) didn’t arrive until Friday due to weather, but finally it’s all under one roof again. Yes, yes it is. Your point is… ? Apparently not everyone has huge hunks of rusty scrap metal and barnyard paraphernalia lying around their houses? What is so wrong with that, people? After showing our house one Realtor left this as feedback for us: “Buyers were distracted by the nostalgia.” I’m thinking the Pac-Man machine got a lot of use during that particular showing. My friend Melissa (who is homeschooling her kids) just tagged me in this picture of her son’s schoolwork and said it reminded her of me and all of my moving trucks. How appropriate. 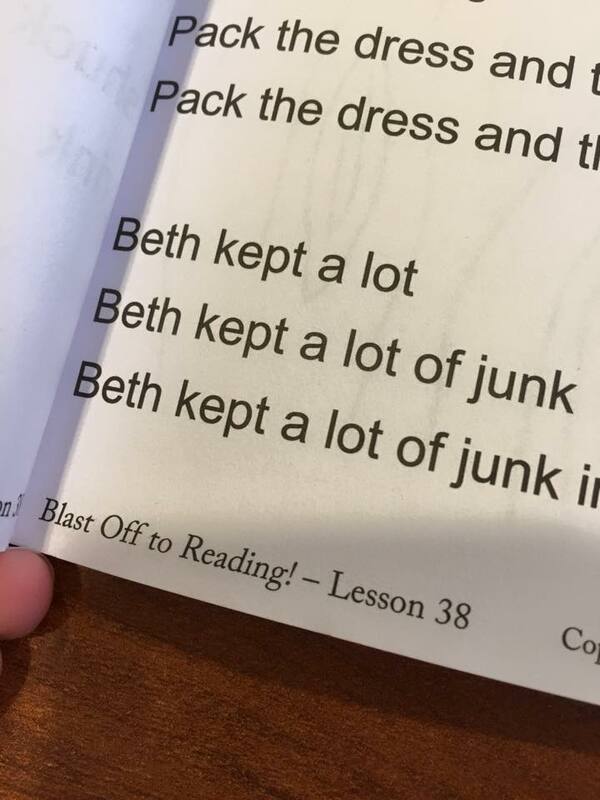 And now Beth needs to sell a lot of junk. If you’re in the Birmingham area, be on the lookout for a major yard sale coming soon. I’ve had so many comments about how I must be “working my magic” on the new house already, but let me assure you that I have no magic available to conjure up right now. First I am focused on getting the essentials located and unpacked (hello, toothbrush, old friend!) and then I will have plenty of time to focus on DIY and decor. I know some home bloggers make a marathon sprint right out of the gate and have their entire house spotlessly put together in less than six months, but considering this big ol’ pregnant belly is only getting bigger by the day and I’m not allowed to drink any caffeine, I am looking at more like six years before I’ll be completing any major projects. 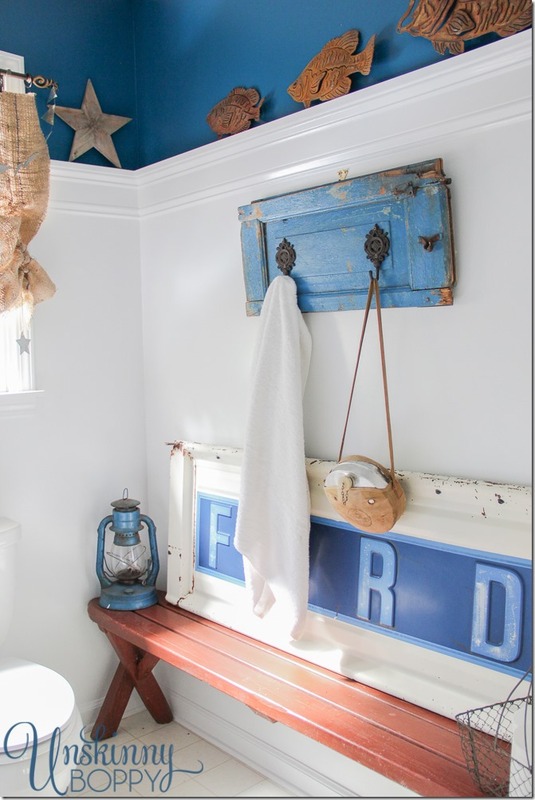 I’m pinning up a storm at night trying to figure out how I’m going to incorporate my style into this house. Y’all feel free to join me on Pinterest and share my dreams and schemes. Right now it’s the only organized place in my life. In the meantime, if you don’t hear from me for a few weeks, send the search and rescue team to my garage. You’ll probably find me under the pile of chicken crates, mason jars and old wooden ladders. Whew – I know you’re glad the move is done.. Take your time on unpacking, with this house (hopefully my LAST house), I’ve been taking my time as I realized what worked where in my old place would not work here and I didn’t want to move heavy pieces around AGAIN. And, how much fun for you – a new girlie room to bring alive…. Only need a few pieces to finish (been here a year) and then I’ll be set for a long while. Maybe I’ll wait on your tag sale for these last few…. I am seriously considering a road trip whenever you have a yard sale-you have some treasures lady!! Beth, we gutted our kitchen in our 100 year old house in homewood when i was 6 months pregnant and had an almost 2 year old, so I feel ya! I’m a huge garage sale fan so will you shoot me an email when that cache of wonderfulness is happening? Good news though… that baby is now 12 and the kitchen is still going strong! It took me two months to unpack, and I still have yet to hang pictures on the walls. The worst part is the shop full of all the stuff that was in our previous shop, ha ha! Someday I swear I will go through it. My husband was losing his mind packing that stuff up. 10 years here and I’m still not done! oh man… my post didn’t work on my phone… please delete? Will comment from computer. 10 years here and I’m still not done! Thank goodness… or there’d be nothing to blog about! Loved this post Beth… these kind are the absolute best! Oh Beth! Don’t rush it — take it a day at a time. Focus on your family and making that baby. Everything will come together in good time. i must be old, I didn’t know Jane was replaced by Beth in school. Jane was a junker too I’ll bet. well – that must be a huge relief! one step closer to being settled. congratulations make sure you REST! beth, this post made me smile so many times. So happy you are in your new home, tailgates, chicken crates and all! Hope you’ll be sharing pictures after you get settled. Enjoy! I am one of those subscribers that gets my email infrequenlly for whatever reason. 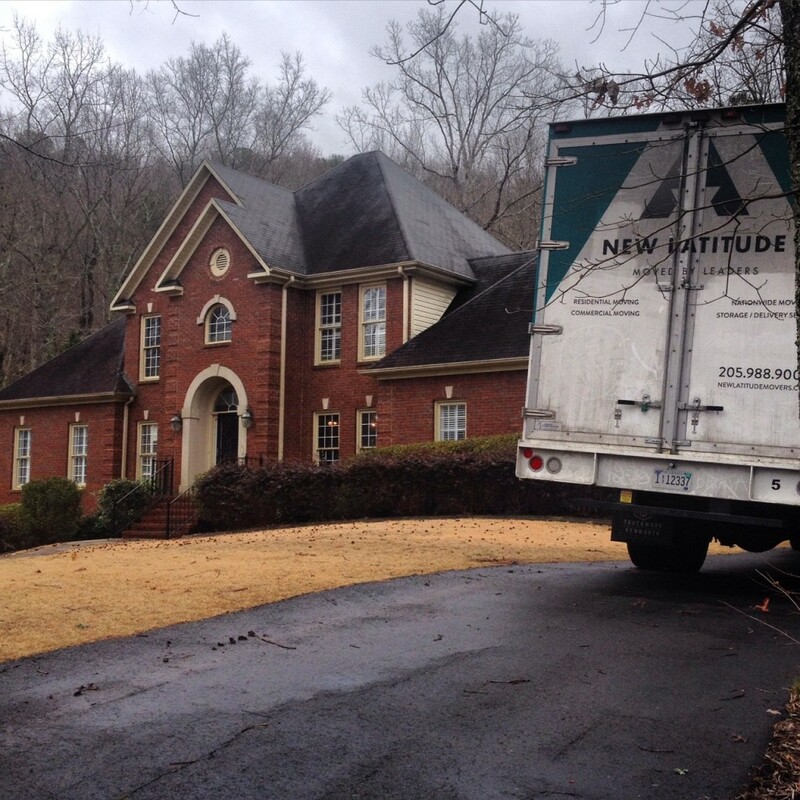 So, I am curious to know If the moving truck is parked by the old or new home…. luckily if have no moved a lot in recent years. the biggest error ever made was trying to get the boxes emptied and put away. then later when we were more at home in the new location the things put way were not always in the most appropriate sensible places. so take your time and try not to be to impatient with yourself.